An on-the-run killer who almost decapitated his mother's ex in a "frenzied" attack has been recaptured. 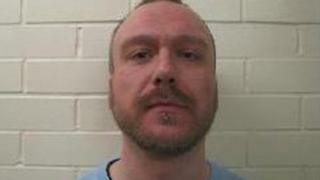 Andrew Craigie, 38, had disappeared from HMP Sudbury, an open prison in Derbyshire, on Wednesday morning. Craigie was arrested on Tixall Road, Stafford, at 23:00 BST, Staffordshire Police said. He was given a life term in 2007 after admitting the manslaughter by diminished responsibility of Geoffrey Watkins in a knife attack in 2006. Craigie, from Stoke-on-Trent, pleaded guilty at Stafford Crown Court to killing Mr Watkins, 61, who suffered fatal wounds to his throat. The court was told Craigie, who was ordered to serve at least seven years in prison, had an untreatable personality disorder. HMP Sudbury is a category D prison and calls itself a "rehabilitation and resettlement prison".